To a small extent, the Il-28 could trace its ancestry back to the first jet bomber, the German Arado Ar 234. Ilyushins first jet bomber, the Il-22, had closely resembled an enlarged Ar 234C, and several features of the German aircraft (the slim fuselage, shoulder-mounted unswept wing with underslung engines, and the large slotted flaps) were carried over into the Il-28. In December 1947, Ilyushin started development of a small, more compact bomber, trading range for speed and manoeuvrability. The pilot was seated to the bomb-aimer’s rear, above the nosewheel bay. A fighter-type canopy (the first on a Soviet bomber) provided ade-quate height for the pilot’s cockpit. The fuel was housed in five flexible tanks in the fuselage, forward and aft of the wing. The centre fuselage housed the bomb bay, large enough to house 12 551-lb (250-kg) FAB-250 bombs; the lower front fuselage accommodated a mapping radar and two NR-23 23-mm cannon. The pressurized Il-K6 turret, mounting two 23-mm NR-23 cannon, was housed in the tail of the fuselage. The rear gunner was the only member of the crew without an ejection seat. The gunner doubled as the radio operator, the VHF and HF communications equipment being installed ahead of the turret. The engines were ahead of the main wing structure, the jetpipes passed beneath the wing, and the single-wheel main landing gear units were located beneath the jetpipes. The wings were built in upper and lower halves, which were joined together after hydraulics and other plumbing had been installed, and were built in sections to minimize the need for large production tools. The high wing eliminated the need for any complex carry-through structures around the fuselage and nacelles. Also, most of the fuselage and nacelle skins were single-curvature surfaces (much of the fuselage was an almost perfect cylinder. 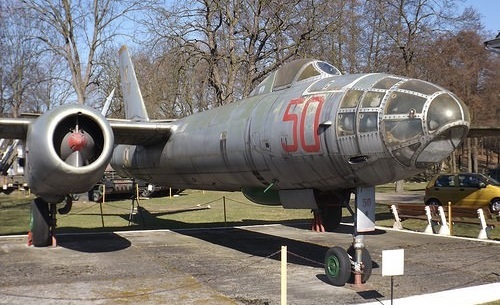 A medium bomber, first flown on 8 August 1948, the Il-28 prototype flew on two RD-10 (Jumo 004 development) 2270kg thrust Klimov RD-45F turbojets, but the British Nene were substituted and, in VK-1 form, remained standard in the 10,000 or more subsequent examples. In October 1948, the Il-28 was evaluated against the larger but similarly powered Tupolev Tu-78 in the light bomber role; the Ilyushin aircraft proved faster and more agile, and was selected as the replacement for the obsolescent Tu-2. A formation of 25 pre-production Il-28s took part in the 1950 May Day Moscow fly-past, by which time large-scale production had been initiated at several factories. Series aircraft, which entered service with a large number of V-VS bomber regiments, incorporated aerodynamic refinements, Klimov VK-1 provision for detachable wingtip fuel tanks. Preparations for large-scale production were undertaken with great urgency, and the type entered service in September 1950. The only major change during development was the switch from the RD-45, used only in the prototype and pre-production aircraft, to the similarly sized but usefully more powerful VK-1. Known to NATO as Beagle, it equipped all the Warsaw Pact light bomber units in 1955-70 and was also adopted by the AV-MF as the II-28T torpedo bomber. Armed with two internally carried torpedoes, the Il-28Ts were replaced by Su-17s in the mid-1970s. The Il-28U dual trainer, NATO code name ‘Mascot’, has distinctive stepped cockpits, and the Il-28R reconnaissance versions (many probably converted bombers) carry a wide range of electronics and sensors’ and wing tip-tanks. No longer a frontline type in the Soviet Union, the Il-28 remained in service with some 15 air forces outside Europe, the most important being that of China where some hundreds were built under a licence granted before 1960. Another version was unarmed and demilitarized, used by Aeroflot for high-speed package deliveries — for example, the matrices used to print Pravda throughout the USSR — and to gain jet experience in the civil environment before the introduction of the Tu-104. Later, some Il-28s were converted with radio control systems and used as target drones. With its internal weapons bay, it could carry large conventional stores such as a 6,614-lb (3000-kg) bomb, or a tactical nuclear weapon. 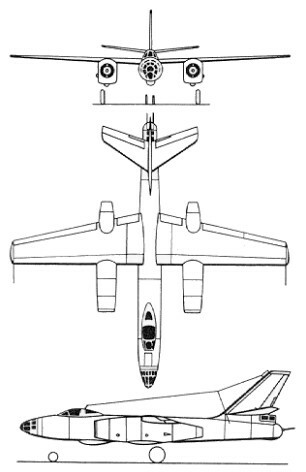 The Il-28 rapidly became obsolete as a tactical combat aircraft, and it was replaced by the transonic Yak-28L from 1963—4 onwards. The Il-28 was a standard type with Warsaw Pact forces, and was widely exported. The type saw some action in the Middle East and the Nigerian civil war in the late 1960s. The biggest operator of the Il-28 outside the Soviet Union was China, which is believed to have received a substantial number of the type in the late 1950s. Shortly after the Sino-Soviet rift of 1959, engineers at China’s Harbin aircraft plant analysed and copied the Il-28 airframe and systems (the VK-1 engine was already in produc-tion for the MiG-17) and began to produce the aircraft at a low rate under the designation H-5 (sometimes rendered as B-B in the West) from 1966 to the 1980s. Like other Chinese-built Soviet types, the H-5 is a clone of the original: a copy so exact that it is almost indistinguishable from the Il-28. In 1980, it was reported that the H-5 was still in production at Harbin, and that more than 400 aircraft were in service, some carrying nuclear weapons. In the bomber field, light duties were assigned to the Harbin twin-jet Hongjhaji 5 - alias Ilyushin Il-28 ‘Beagle’ - production having finally tailed off only in the early 1980s. Despite having flown as a prototype almost 40 years ago, on 8 August 1948, and having long since been withdrawn from first-line service by WarPac, the Il-28 tactical light bomber, in its H-5 version as built by Harbin provided the tactical bombing backbone of People’s Republic of China Air Force in 1987. 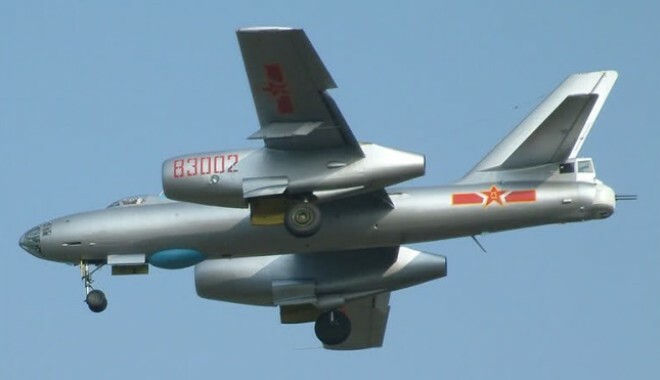 Between 600 and 700 were built in China 1966-1982, some 500 serving with PRCAF and about 130 with PRC NavAir in 1987 Powered by two 5,952 lb St (2 700 kgp) turbojets based on Klimov VK- 1. The Il-28U was known as HJ-5 in Chinese operational service. In Europe the Romanian air force operated this type until December 2000.
three-seat bomber and ground attack. Engines: 2 x 5952 lb (2700 kg) thrust Klimov VK-1 single-shaft centrifugal turbojets. Wing span excluding tip tanks: 21,45 m (70 ft 4.5 in). Length (typical): 17.65 m (57 ft 10.75 in). Height: 6,70 m (22 ft 0 in). Wing area: 60.80 sq.m (654.5 sq.ft). Max speed: 900 km/h (559 mph) at 4500 m (14.765 ft). ROC: 2,953 ft (900 m)/min. Service ceiling: 12300 m (40,355 ft). Range at high altitude with maximum fuel 2180 km (1,355 miles). Range with bomb load: 684 miles (1100 km). Empty wt: 12890 kg (28,417 lb). MTOW in original bomber role: 21000 kg (46,296 lb). Armament: 4 x 23 mm NR-23 cannon, internal 3000 kg (6,614 lb) or two AV-45-36 torpedoes.